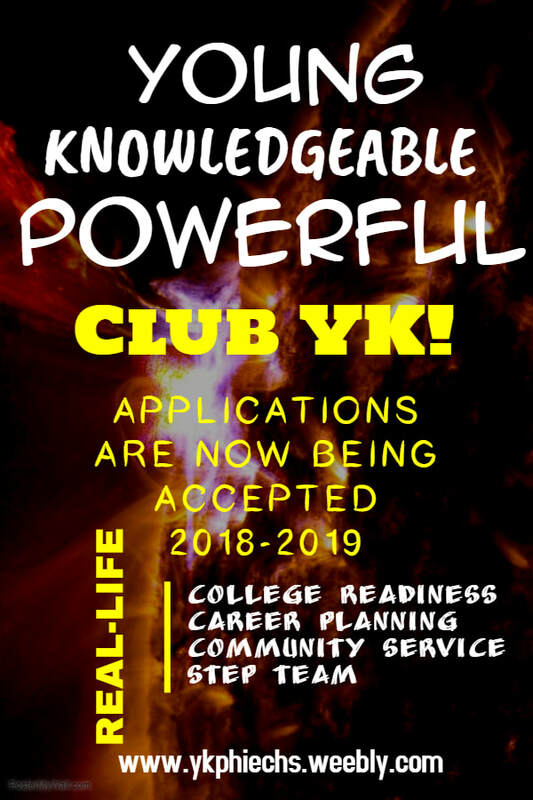 ​Young, Knowledgeable, & Powerful, better known as YKPhi, is a club focused on fostering the academic preparation and achievement of the scholarly leaders of East Coweta High School. The students who are selected to participate in YKPhi will learn the value of commitment, teamwork, community service, discipline, and school involvement through the development of real-life skills. The members of YKPhi will serve as role models for the school and the community. Members of YKPhi are expected to be exemplary students in academic achievement and behavior. All members must have a heart for community service and be willing to lead school and community service initiatives. Members of YKPhi will be selected for participation on an annual basis through application only. No student is required to be a member of this club therefore; participation is considered a privilege and an honor. The members of the club will be comprised of freshman, sophomores, juniors, and seniors who will continue the club’s tradition of practicing academic responsibility, behavioral responsibility, commitment, hard work, self-motivation, and community service.